In this companion piece to his previous short story collection, Town, award-winning Australian author James Roy brings us a cross-section of city life told in twenty-two short pieces. Although aimed at a Young Adult audience, I (an adult) found it enjoyable. There are some drug references in the novel, but substance use is not portrayed. Set in an unnamed modern Western city, Roy offers us tantalizing glimpses into the lives of some young adults. Roy is a skilled tease. With economical use of words, he gives us a lot – and leaves the reader wanting to know more. The characters span the social spectrum – the unemployed, junkies, poets, artists, private school boys, students, speed-daters, workers, visitors from the country – mostly strangers, are linked by invisible threads. The connections that bind a city's inhabitants similarly unite the protagonists... the music, the streets, nightlife, the buses, the poem scrawled on a wall, the sporting teams. Roy elegantly demonstrates that we are all only separated by a few degrees. Each piece in this anthology skilfully portrays the hopes and disappointments, wisdom and stupidity, prejudices and tolerances, pain and resilience of these people. They are all unique, yet easily recognisable. My favourite was Lauren the nurse, and her budding romance with an African musician, but admit to a soft spot for the slow-witted Chunks, who takes umbrage at a thug and ends up naked and hog-tied, dragging his equally impulsive mates into a head-on confrontation with a group of armed men. City can be read as a series of discrete short stories. But this would be denying the fun of referring back to a previous story, to confirm where you might have read about this particular person earlier as they make a cameo in another's story. 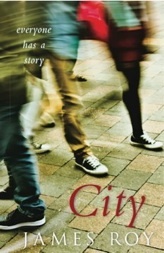 Beautifully written with an economy of words, City had the effect of making me want to go back and read Roy's previous work Town. I can offer no higher praise to a writer than that. A set of teaching notes is also available from the publisher, RRP $19.95.